At long last, here are the battles for Turn 4 of the Firestorm Caen online campaign! To date, 143 battles have been fought across the world as the Allied forces try to wrest control of Normandy from the stoic German defenders. The Allies have had a slight edge in the battles of the campaign but have faced some serious problems on the campaign map. 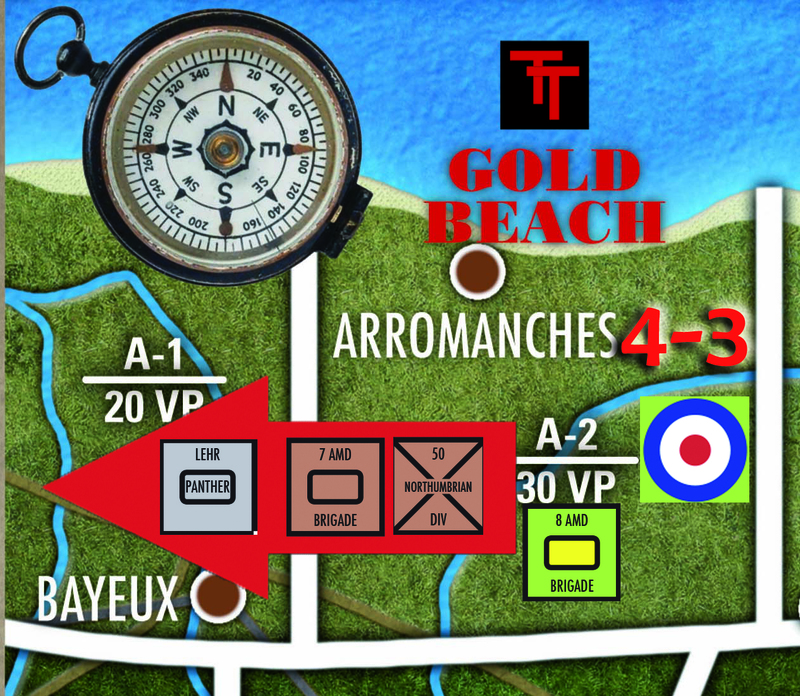 Turn 3 saw the Allied firestorm troops on Sword Beach get destroyed in the German attack. Allied forces will be hard pressed to control Caen by the end of the campaign. 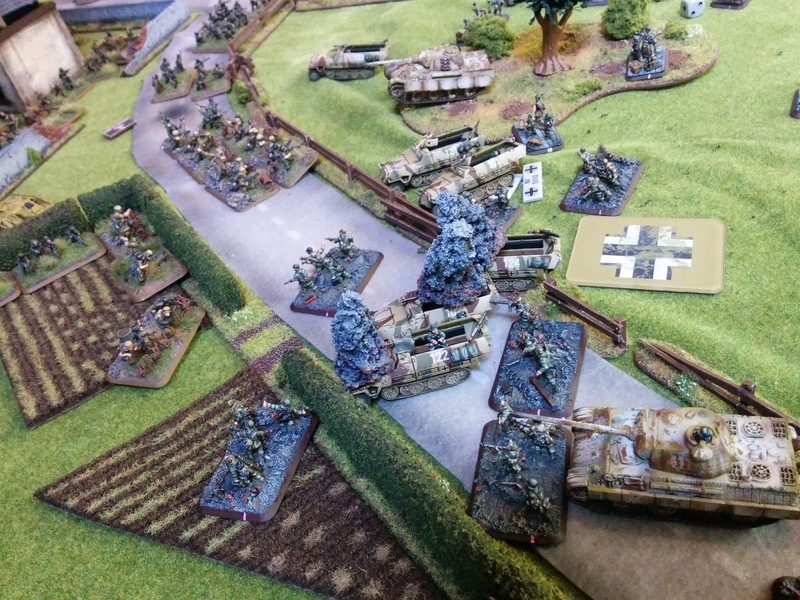 Will the Allied forces break through against the tired German defenders or have the German forces delayed enough to slow down the Allied advance? Read on for the battles to decide the fate of Normandy! Hello fellow campaigners! 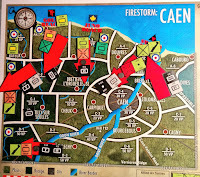 Today I have the recap of the Turn 3 results for the Firestorm: Caen campaign. 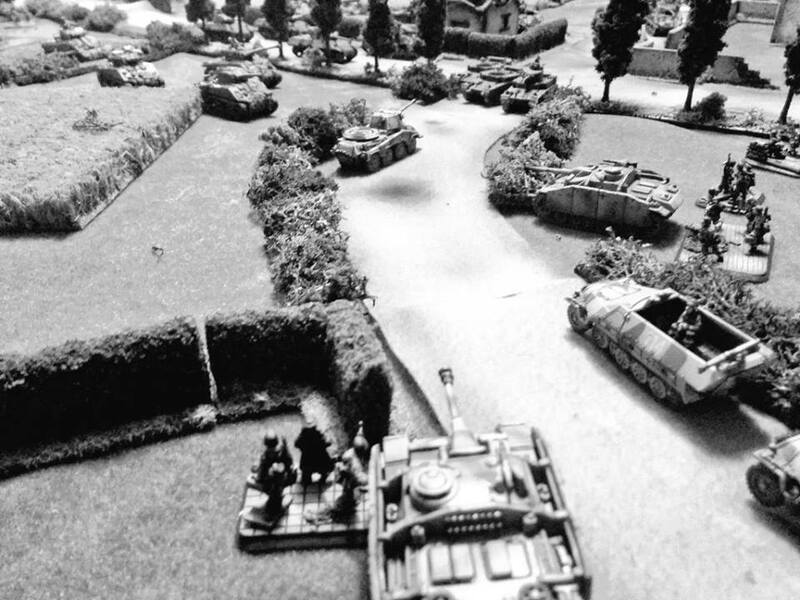 This turn featured fierce fightings across Normandy. Players from around the world completed 41 battles over the 6 different campaign locations. The Allies need to expand their beachheads to bring their superior numbers to bear,. The German forces are threatening the beachheads while also trying to surround the overstretched Allied forces in the South. Read on for the outcome of this turn. 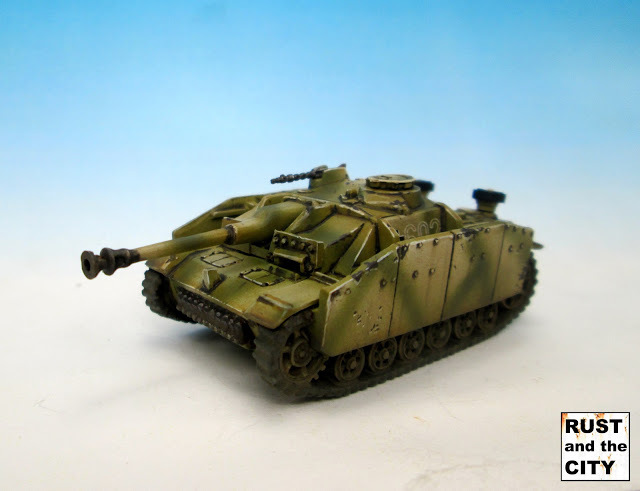 In today's post I am going to share some pictures of a recently completed Open Fire Stug for Flames of War. I made a short tutorial for this model using twitter. In this post I will share the step by step painting of this model in a series of tweets. I'll add some more detail to each section as we go along. 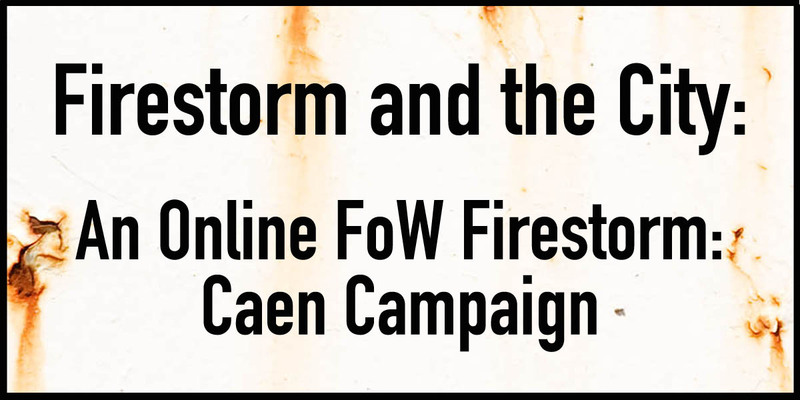 In today's post you will find all of the details for the six games that will be played for turn 3 of the Firestorm: Caen online campaign. So far, players from 3 continents have played 103 games. To date, the Allied forces have made gains in the Southern part of the map and are hemmed in on Sword and Juno Beach in the North. This turn sees both Axis and Allied forces attacking three times. Who will win the day and gain a massive advantage in the struggle for control of the land around Caen? Hello campaigners and followers from across the globe! Today, we will reveal the results of Turn 2b of the Firestorm: Caen global campaign. 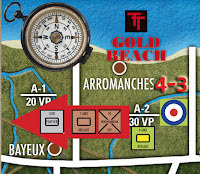 This turn has seen lots of exciting games played around the world as players vie for supremacy of the territory around the British parts of the Normandy coast. Stunning Allied advances have been equally matched by the determined resistance of the German defenders. Read on for details of how the battles unfolded. I recently painted the electric creation for my Ramos Malifaux crew. This model is the newest addition to my crew. This is a plastic model. It was tough to assemble but fun to paint. In this post I will share some pictures of the model and will discuss how I plan to use the model in games. 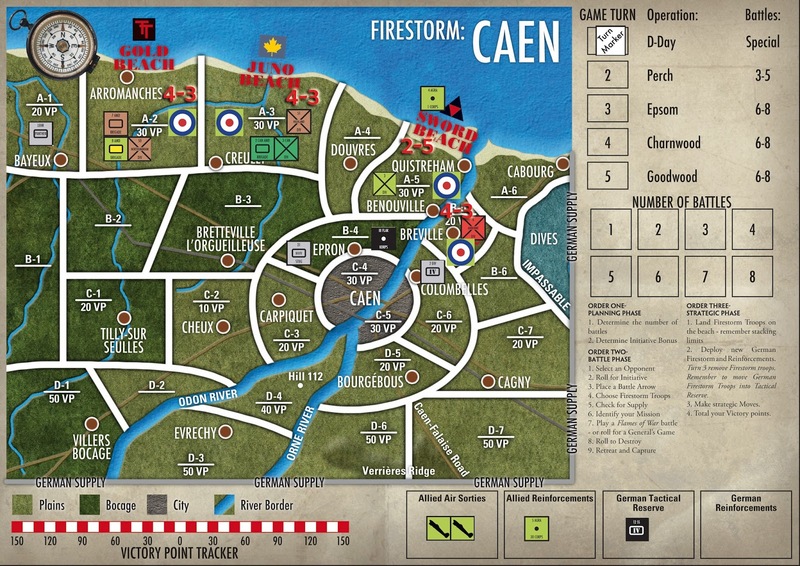 This week saw the conclusion of Turn 2a in the online Firestorm: Caen campaign. In this post I will outline a brief recap of turn 2a. I will also post the battles for turn 2b. Turn 2 was split into two sections. Turn 1 had an extra battle to resolve at Sword Beach and an extra battle was triggered in Villers Bocage by the events in the Battle of Bayeux. You can see the battle outlines for Turn 2a here. 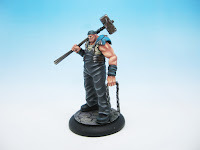 In this post I will share some pictures of Johan the Steamfitter for Malifaux. 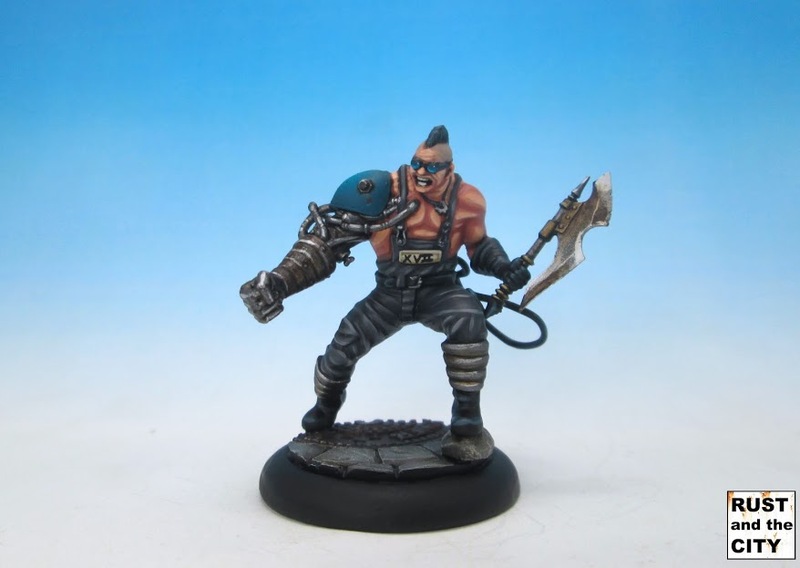 Johan is a mercenary from The Outcasts faction but has a lot of synergy with the other M and SU models in Ramos' crew. This model is an individual plastic crew box. This sculpt is very interesting and was extremely enjoyable to paint. In this post I'll share some pictures of the finished model. 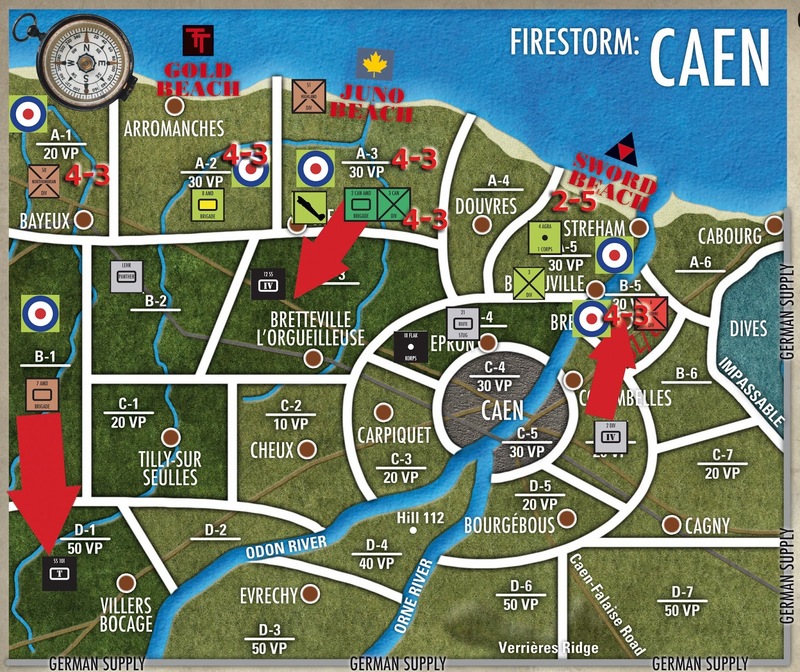 In this post I post the details for the first part of Turn 2 for the Firestorm: Caen campaign. Turn 1 saw a decisive Allied victory as Allied forces won victories in 3 out of 4 sectors. In Turn 2 the Allied forces are attacking into Bayeux while the German forces are launching a desperate assault on Sword Beach. The results are in! I have the results for Turn 1 of Firestorm and the City! Allied forces have landed on the beaches of Normandy and established beachheads on Gold, Juno, and Sword Beaches. Allied Airbourne troops at Breville have landed and disrupted German reinforcements. For this turn we had a total of 37 battles. 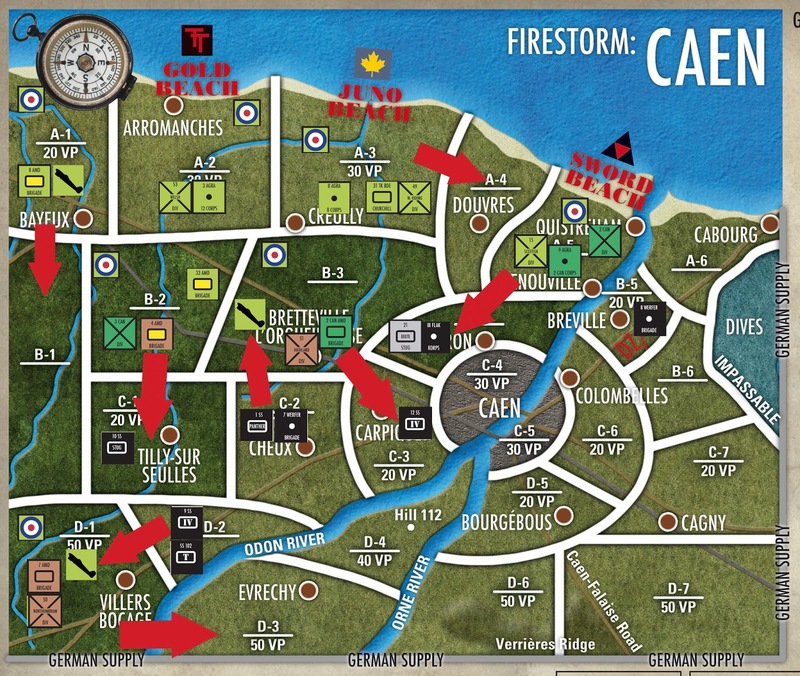 Read on for the full results of turn 1 of the Firestorm: Caen online campaign. I am often paralyzed with painting models like these. Masters, Generals, Lords, Bosses, and other important models are often intimidating to me. I want them to be the best painted models in my force and I become afraid of making a mistake. This model is the epitome of this perfection paralysis for me. I was intimidated by the big areas of cloth and trying to make a fairly plain model stand out among a crew of steampunk cyborgs. Read on for some pictures of a fully painted Ramos. 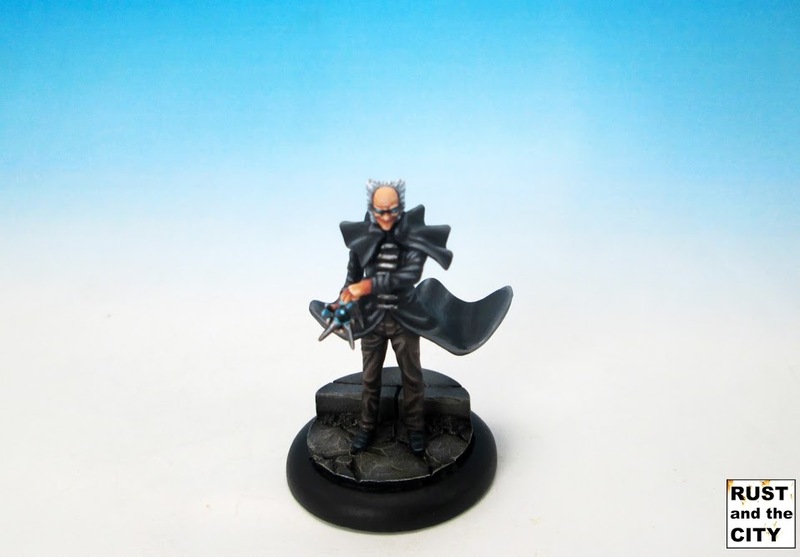 I've finished painting Joss for my M and SU crew for Malifaux. Joss is a henchman in Ramos' crew. This model was lots of fun to paint. In this post I'll share some pictures of the finished model. 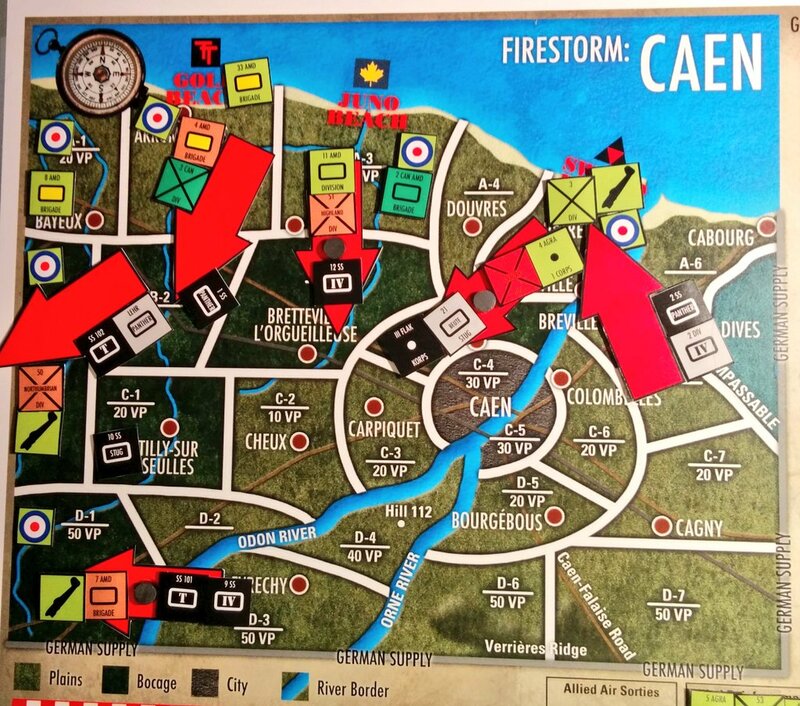 Today I will post the games and scenarios for Turn 1 of the Firestorm Caen campaign; Firestorm and the City. This turn focuses on the airborne and beach landings of D-day and the days immediately following D-day. 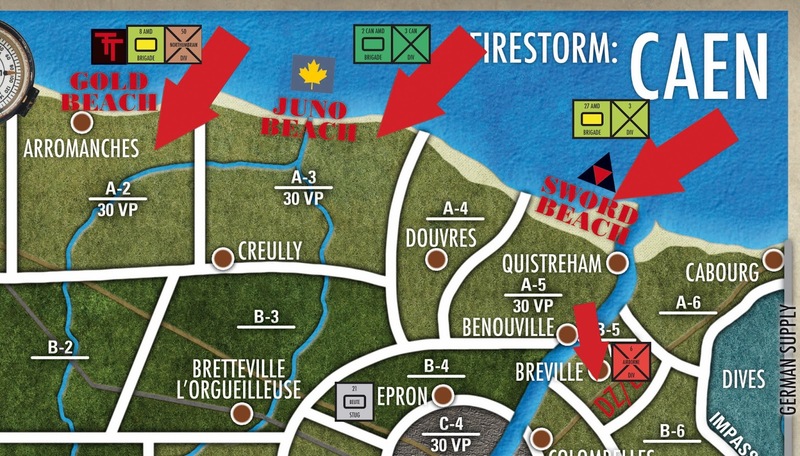 In this turn we will fight the battles of Gold beach, Juno Beach, Sword Beach, and the Airborne landings. 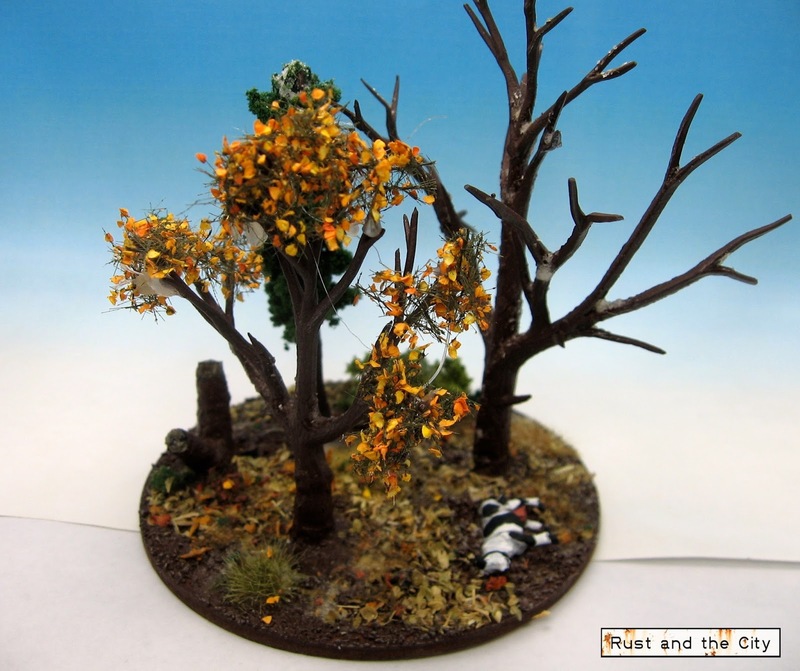 In this post I will post the scenarios for each game and the firestorm troops. This week I finished painting the Howard Langston for my Malifaux crew. Howard Langston is the Steamborg Executioner who has been repaired by Ramos into a half cyborg underling. 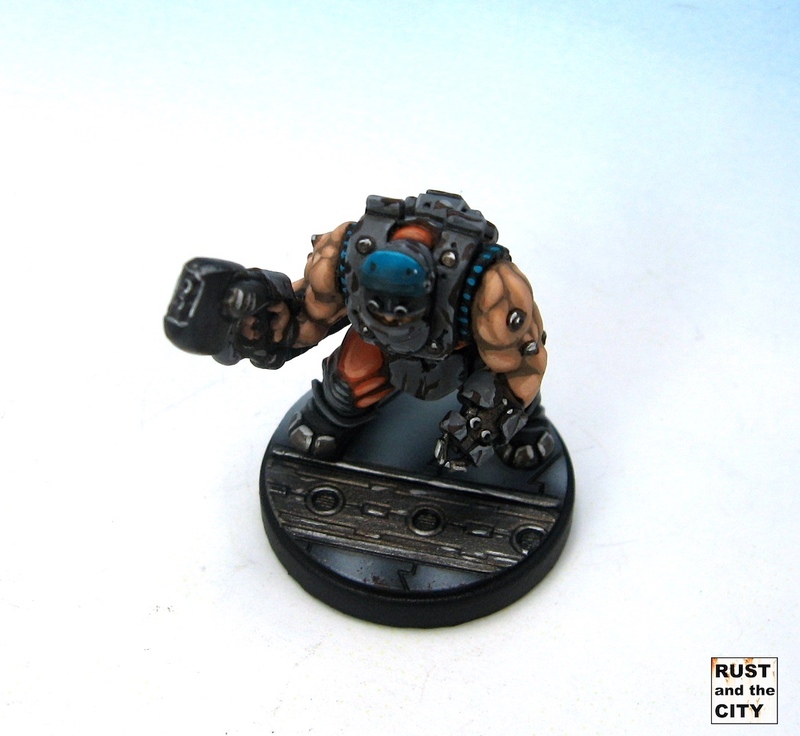 This model is a plastic model from the Wyrd Miniatures M & SU crew box. This model was fun, challenging and frustrating to paint. In this post I'll share some pictures of the finished model. 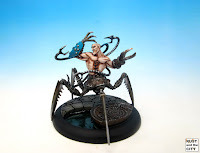 I painted up an Arcanist Brass Arachnid for Ramos' crew in Malifaux. This model joins the steam arachnids I shared last week in my progress for the crew. The model is from Wyrd's M & SU plastic crew box. This model is wonderfully detailed and was great fun to paint. 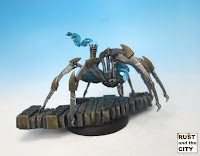 In this post I will share some pictures of the completed Brass Arachnid model and some more scrap markers. 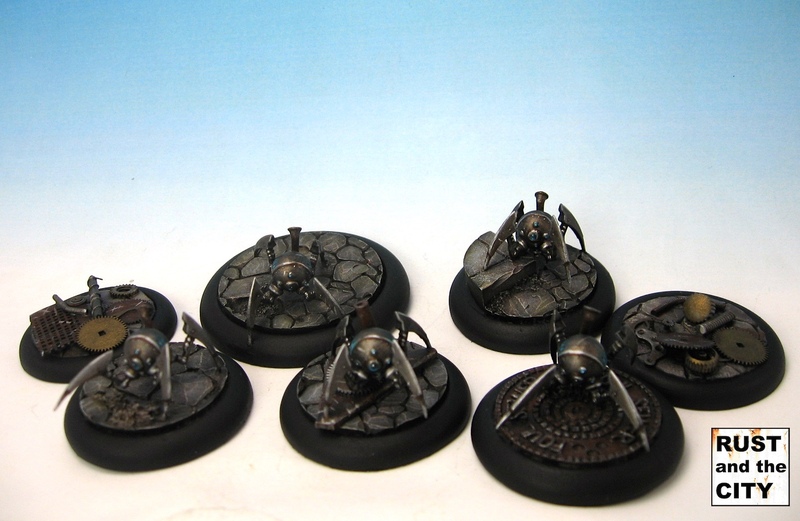 After a demo game of Malifaux at Attack-X, I have started painting a crew with these Steam Arachnids. I've purchased the Ramos starter box and I am slowly working my way through the models. 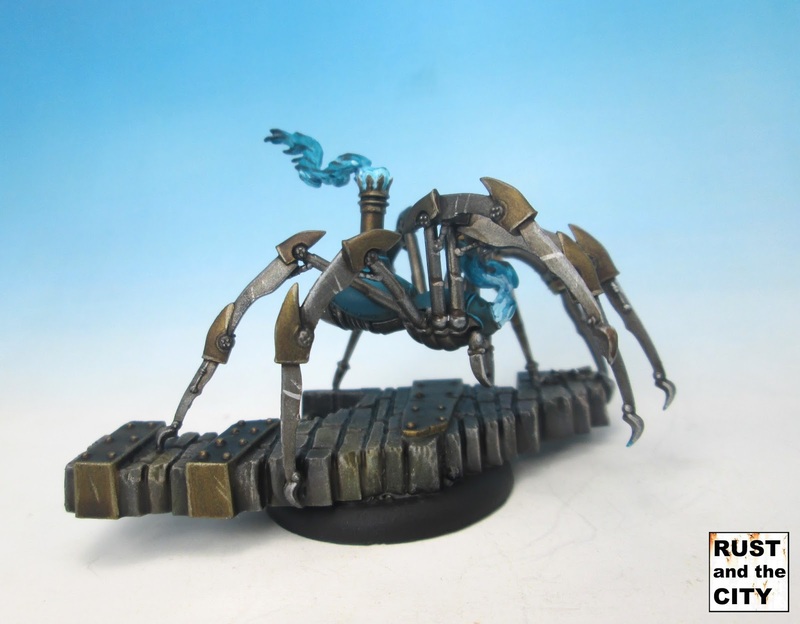 In this post I will share some pictures of the first five Steam Arachnids and some pictures of some scrap counters. 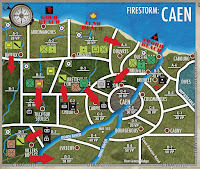 Starting November 1st, Rust and the City will be hosting an online Firestorm: Caen campaign! In this campaign, players from around the world will battle across the bocage of Normandy for control of the city of Caen and the surrounding areas. The campaign will use the Firestorm: Caen system. Players will complete games to determine the victors at each location. In this post I will show you how to sign up and register for the campaign. 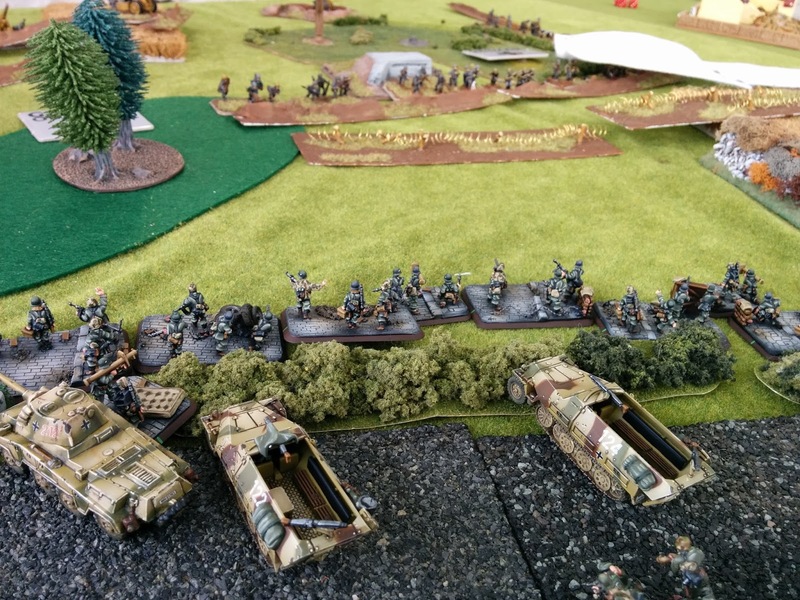 Last week I attended the Attack-X Flames of War tournament in Kamloops, BC. I quickly painted this Pak40 platoon the week before to add some extra punch to my Panzergrenadier list. 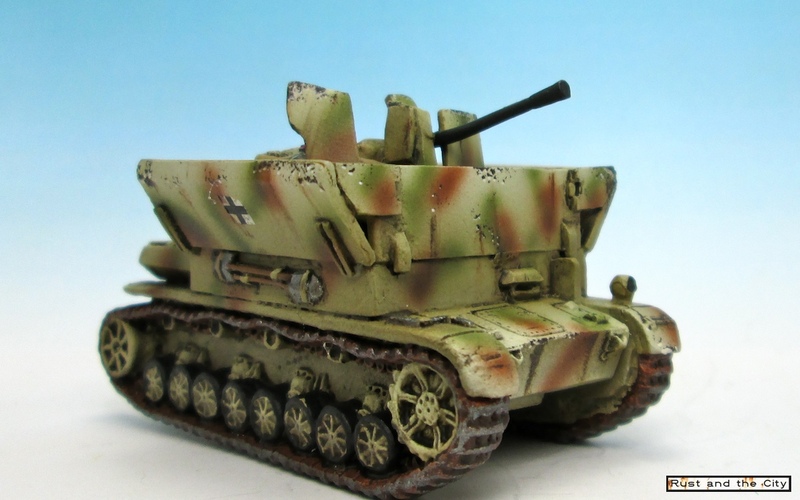 In this post I'll show some pictures of the Pak40s and discuss their role in the Panzergrenadier list. These two 8-rads are the final models for the commission I was working on. The models are safely in their new home. It just took me a few weeks to edit the photos and put the pictures up. 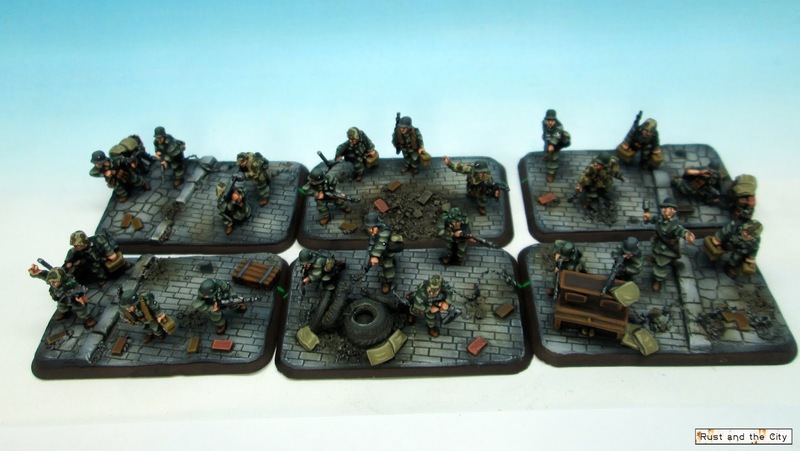 The models are 8-rad armoured cars from Battlefront Miniatures for Flames of War. More pictures after the jump! This is another one of those models I started painting years ago and didn't finish. I've been painting some of them lately as they are a great way to change things up. They're already assembled, primed, sometimes basecoated, and ready to paint. I'd already painted about half of this model but I went back and completely repainted it. This model is a metal Male Drone for Sedition Wars and is produced by Studio McVey. 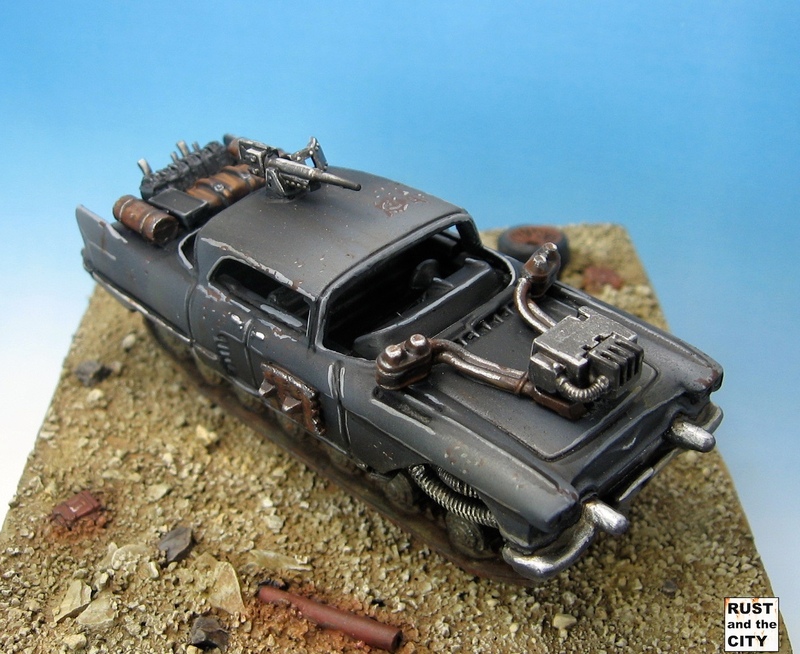 Like many hobbyists, after seeing Mad Max: Fury Rod I started seeing every toy car as a potential Mad Max conversion. After finding a suitable car I set about converting it with different bits I had sitting around. I then painted it up and built a small diorama display base for the model. In this blog post I'll share some pictures of the completed model and base. 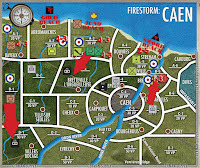 Starting November 1st, I am going to host an online Flames of War, Firestorm: Caen campaign and you can participate! Rounds will be played over a series of weeks. Participation will be open to any who are interested in participating. In this post I will outline how the campaign will work and how you can participate. As part of the commission I have been working on, I built a panzer recovery vehicle. The vehicle is based off of a plastic Panzer IV hull. The recovery vehicle turret is scratch built. In this post I'll show some pictures of the recovery vehicle. I painted a command stand and half-track as part of the commission I have been working on. The command stand is a General model for use as a special character in Flames of War. 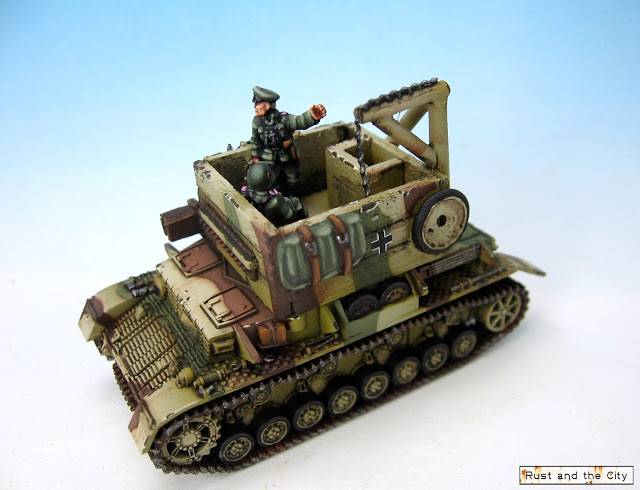 The half-track is his transport from the Sd.Kfz 251/1 D plastic box set. 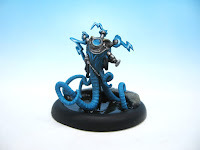 In this post I will show some pictures of the finished models. This post will show some pictures of a recently painted 15cm Nebelwerfer platoon for Flames of War. I'll also share my experiences with the tactical uses of 15cm Nebs in Flames of War games. 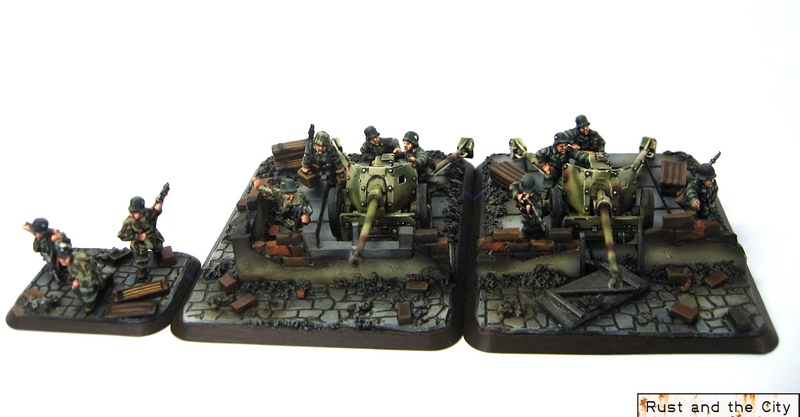 These models are Battlefront's metal 15cm Nebelwerfers. 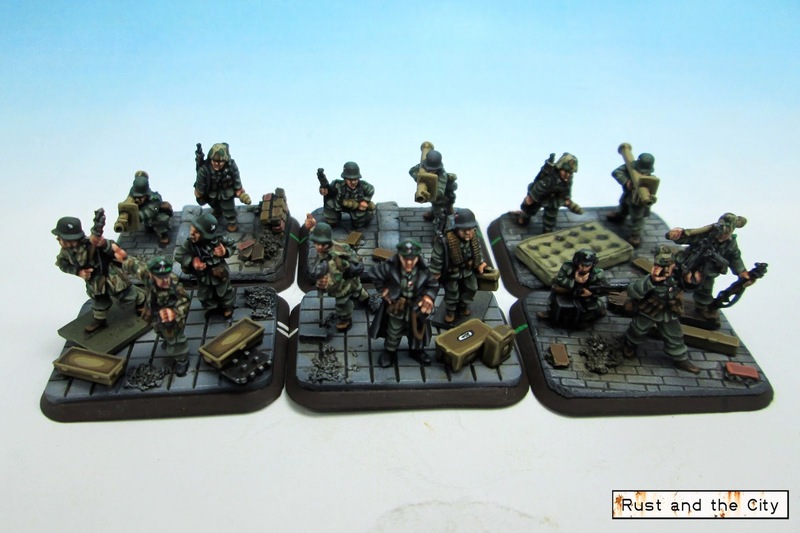 This platoon is the second platoon in this commission which includes the Panzer IVs I showed last month and builds on the Kampfgruppe Peiper commission I completed last year. 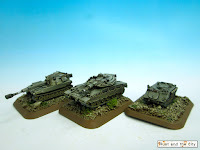 I'm away on vacation at the moment but before leaving I finished 7 panzer IVs for a commission. These models are Battlefront's new plastic Panzer IV Hs. Models are painted with colour modulation and include the new plastic tank commanders. This blog post will include some pictures of the tanks and a discussion on the new plastic models. Yes, you read the title right. 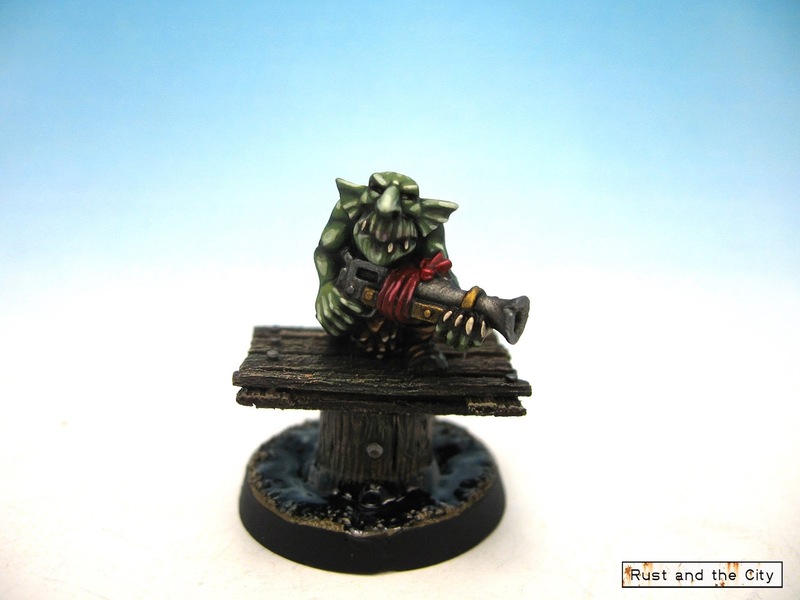 I have painted my annual 28mm Games Workshop throwback figure. The other day I was painting when I had some spare time and decided to paint the last little bit of this poor little Gretchin. In this post I'll show some pictures of the finished model and share a few thoughts on painting diversity and scale. We needed some more terrain for the tournament in Kelowna a few months ago. At the last minute, I built a set of trees for my winter table to contribute to the cause. In this post I’ll share some pictures of my new winter trees and discuss how I built them. 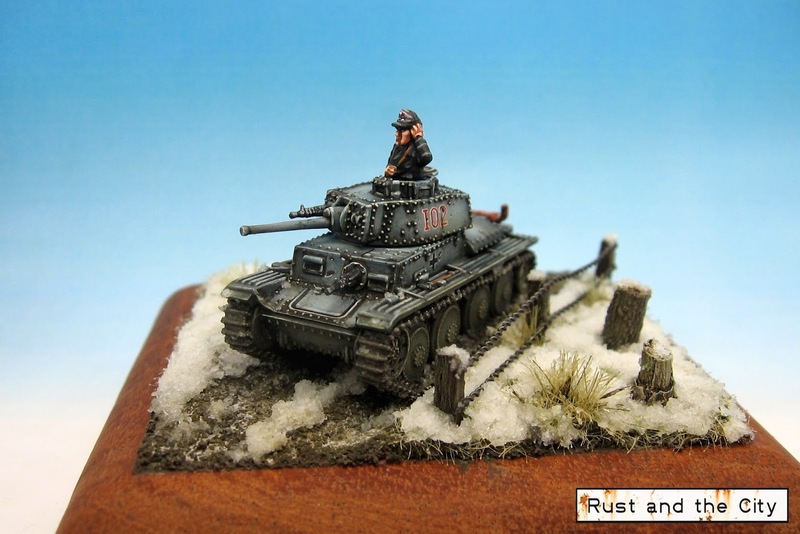 I've painted a small diorama with a Panzer 38t. 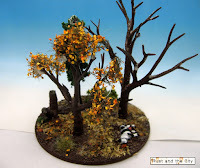 This diorama is for an entry in a painting contest in the fall. The model is a 15mm Plastic Soldier Company German Panzer 38t. The model is set on a winter base. In this blog post I will share some information about how I painted the model and built the display base as well as discussing the Plastic Soldier Company kit. I recently finished painting some 6mm Israeli vehicles from GHQ. I painted these models to test out the 6mm scale for possible Flames of War Arab Israeli Wars games. 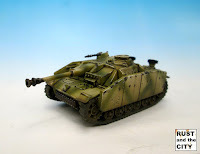 In this blog post I will show some pictures of a painted Merkava IV, M113 Zelda, and (possibly) an AMX. I experimented with airbrushing on the 6mm models as well. I recently made a winter wargames mat for my Flames of War terrain collection. In this post I will share some pictures of it, my thoughts on the construction process, and some links to useful tutorials to build your own mat. This mat was built with latex caulk on canvas backing. The new Six Month Mountain Reduction Painting Challenge is here. After some thinking, I have decided to join the challenge again this year. The 6MMRPC is a challenge to reduce your painting backlog by painting, posting, and not purchasing new models! In this post I will compile a list of my goals for the challenge. 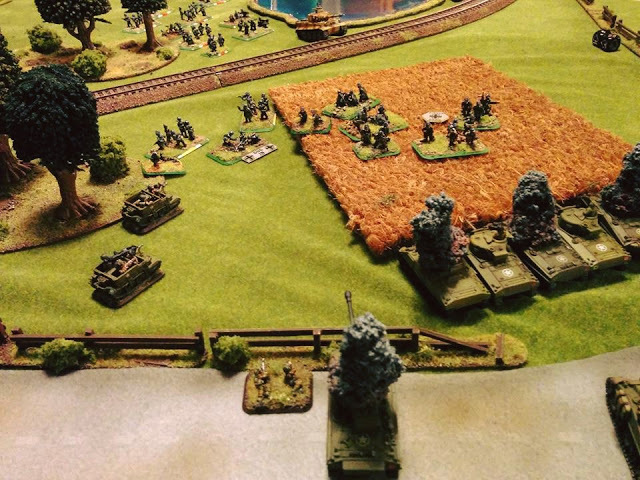 One of my favourite things about Flames of War is the terrain. Unlike some other games, in Flames of War you frequently move through terrain and use it to benefit yourself and hamper your opponent. The layout of a table can have a large effect on the outcome of a game. A skilled player can effectively use terrain to help them on either attack or defense. In this post I will share some of my ramblings on what I think makes an effective and well laid out table for tournament games. This tutorial will show a simple method for making paved roads out of felt. These roads are quick and easy to build and are very low in cost. The roads were painted using an airbrush. Felt roads are commercially available and look great but are quite expensive. 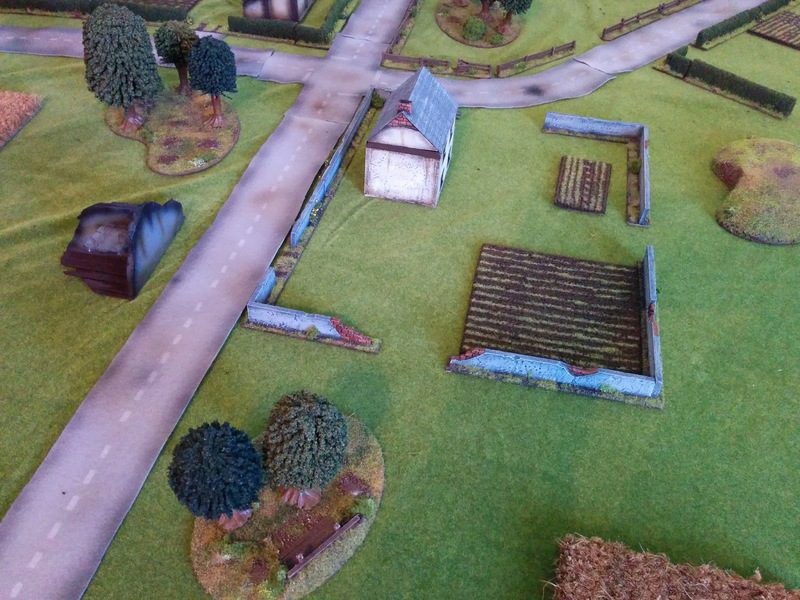 This tutorial shows how I quickly and cheaply made a set of roads for my Flames of War table. 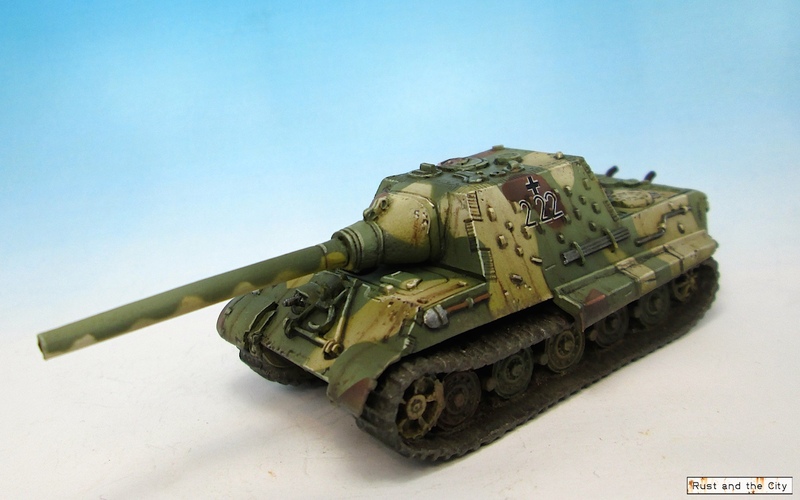 A few months back I posted some pictures of a captured KV-1 I painted in German mid-war colours. Last spring I purchased 8 KV-1s and KV-2s from Zvezda. The idea was to paint them and sell them. That didn’t really happen though. It is all working out though as the models are giving me a chance to try lots of different things. 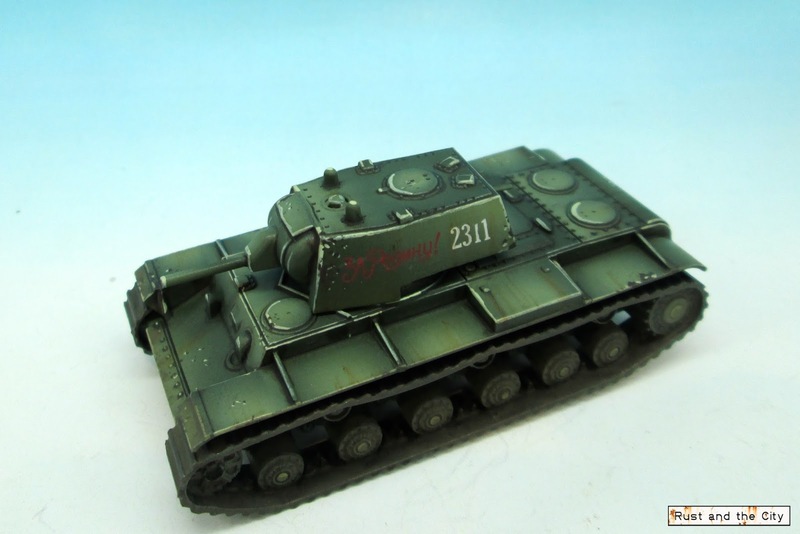 I painted these two KV-1s in a classic Russian green colour to fit with any Soviet company that can take them. I used colour modulation and panel highlighting with the airbrush to paint them with a lot of contrast. Before Gottacon I was feverishly painting to finish this platoon. I finally completed them at 11:30pm the night before the tournament. The biggest challenge with this platoon was to take my time to paint them to the same quality as the rest of the infantry as it was quite tempting to rush them to finish in time. Until the final evening I wasn’t sure if I would actually finish them on time. Fortunately, they were completed in time for the tournament. Read on for more pictures of this platoon. The end of February saw the conclusion of the Six Month Mountain Reduction Painting Challenge. I met some of my goals and not others. I reduced the old lead (well, plastic, metal and resin) mountain and minimized my new purchases. I followed some new blogs and got some significant painting done. Read on after the jump for some pictures of the finished models and a summary of the challenge. This weekend was the Gottacon gaming convention in sunny Victoria, BC, Canada. I attended to play in the Flames of War tournament. Gottacon is a fairly large and diverse convention that has grown out of a very small local event. I won’t talk about the full breadth of the convention here. I’ll share my games and experiences from the Flames of War tournament. 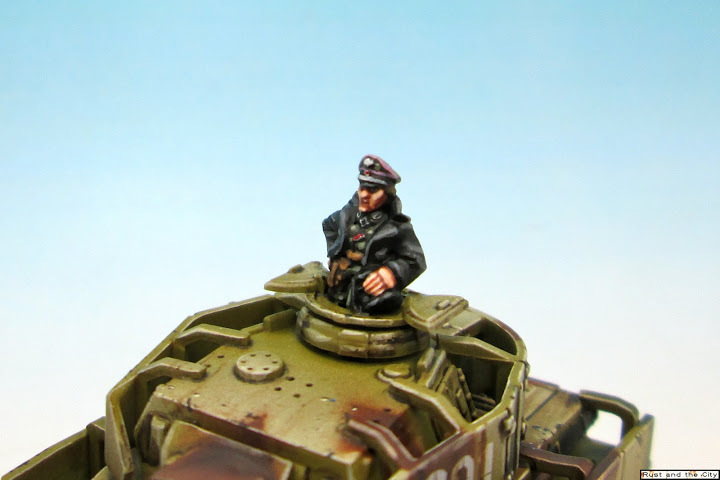 With one week to go it is time for an update on the Panzergrenadier company I am trying to finish for Gottacon. 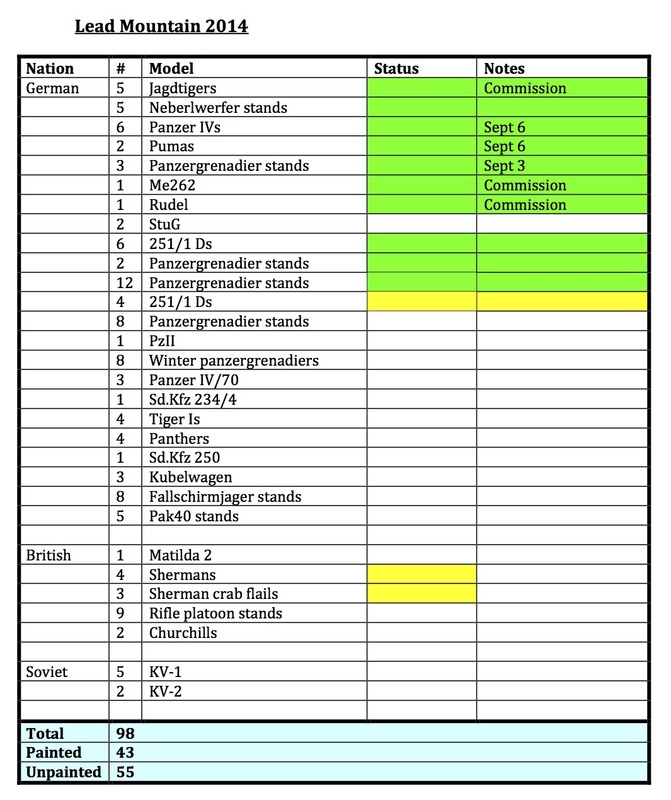 I posted my proposed list and painting chart back in December. Since then I have slowly been working on the company. In the last week I have been painting furiously to try and get it finished for Gottacon. 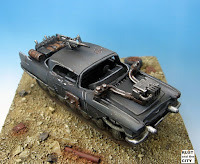 In this post I’ll show some pictures of the finished and in progress models. 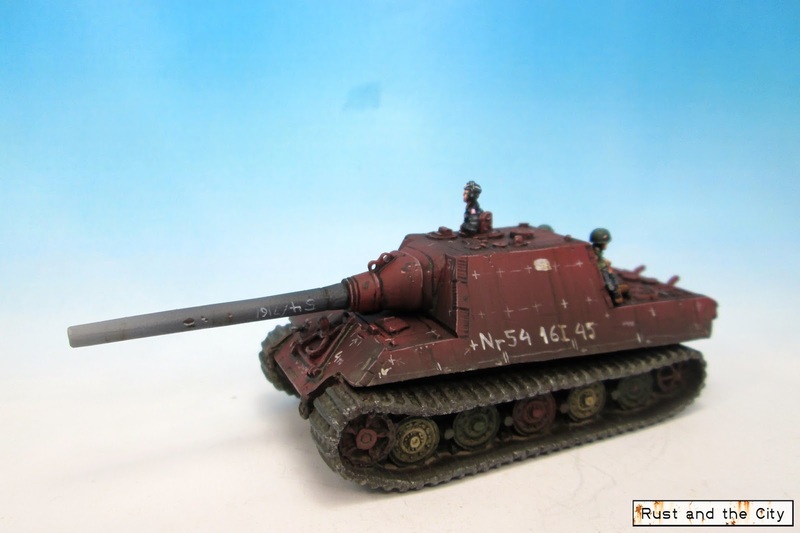 The final Jagdtiger in the series in was painted factory red oxide primer. I've seen a few Jagdtigers in other scales painted in this pattern (and lately a few in 15mm as well). I added chalk markings and a heat resistant grey barrel to match. Read on past the jump for many more pictures and some details on the painting and modelling of the Jadgtiger. In this post I will show some pictures of two winter camouflage Jagdtigers for Flames of War. These Jagdtigers accompany the two green Jagdtigers I posted last week. 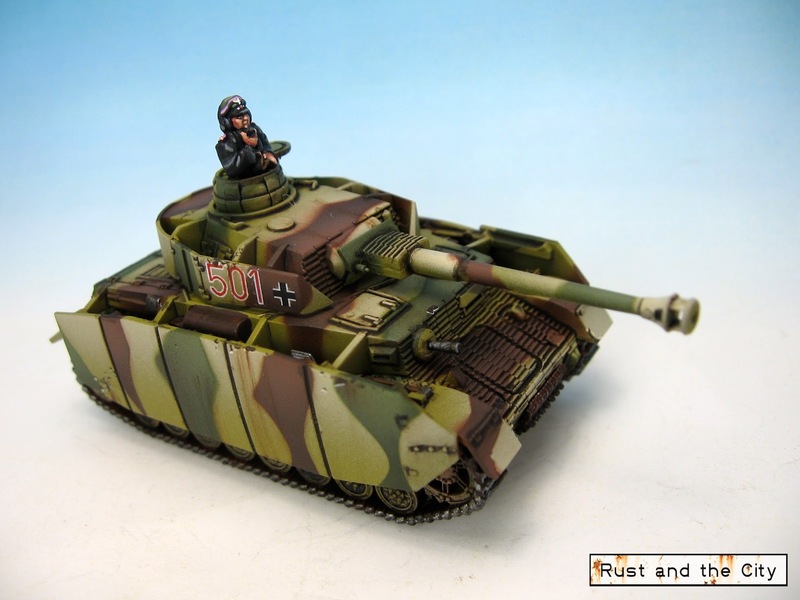 The Jagdtigers were painted as part of a five model Jagdtiger commission. In this blog post I’ll also briefly discuss the role of Jagdtigers in Bridge at Remagen and their effect on the meta. These two Jagdtigers are the first of a set of five Jagdtigers I painted as part of a commission. This project was a bit of a slow burn. The unique patterns on them took me a bit longer than usual to plan out. The Jagdtiger is a pretty impressive model and was fun to paint. 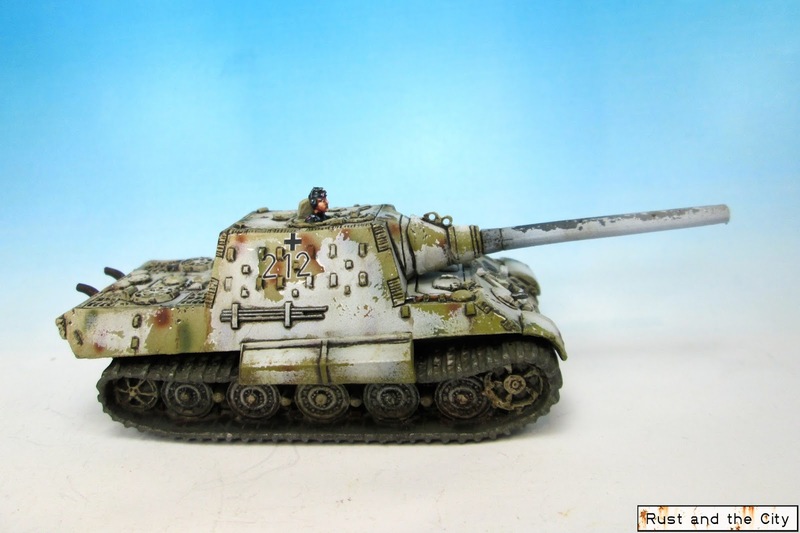 These models were painted for a client for a Jagdtiger list from the Bridge at Remagen book for Flames of War. 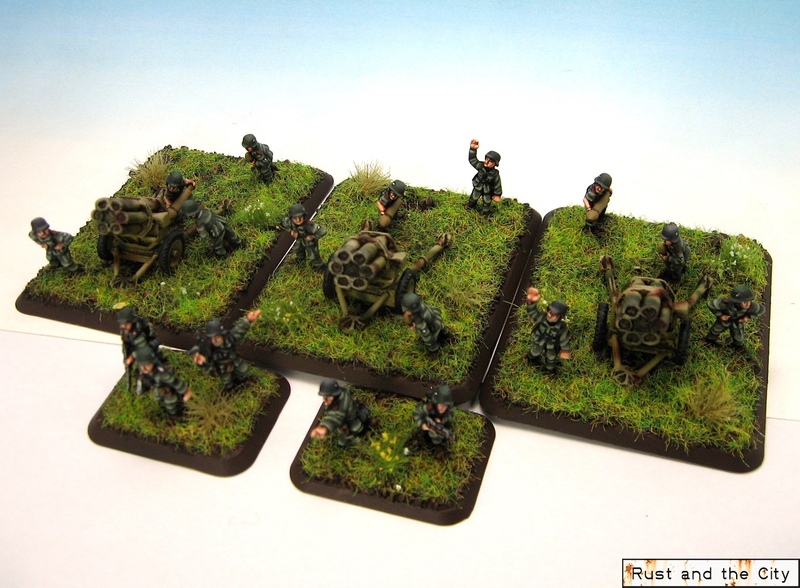 I finished painting this platoon of 15cm Nebelwerfers in September for Attack-X. I wasn't happy with how the sandbags looked and it took me another four months before I took them out of the case and painted them again. At long last I am finally pleased with their finished appearance. So, after a long delay, I present to you my Nebelwerfer platoon. The other day I posted my 2014 year in review. In this post I will set some new goals for 2015. 2015 is already shaping up to be another busy year. Hopefully the increased work and home stability will lead to unprecedented hobby productivity. 2015 will be the year I eliminate my hobby backlog and achieve all of my painting projects. I'll play more games than ever. I'll paint 28mm models too. Well, one can dream... Here are my goals for 2015. This year I am splitting my year in review into two parts. In the first part, I am going to review the year that was and review the goals I set at the beginning of the year. This was a very busy year for me personally and in the hobby. Check back after the break for a review of how I did with completing my 2014 goals. 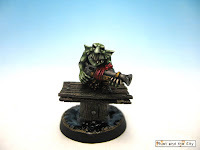 This blog is not affiliated in any way with Games Workshop, Battlefront or Wyrd Miniatures.